There are only seven colors recognized of the plymouth rock breed: the Barred, Blue, Buff, Columbian, Partridge, Silver-penciled, and White. Each color can have very different characteristics while still being the same breed. This is true for the Plymouth breed. 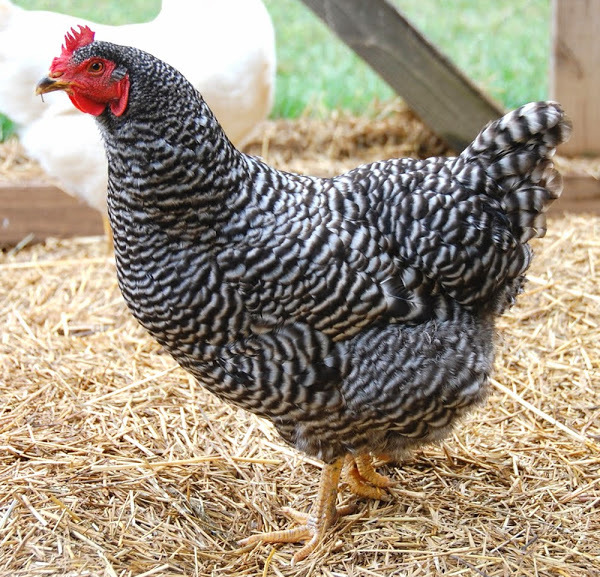 The Plymouth Barred Rock became the most favorite and widespread chicken breed as an industry bird during World War II for their good egg production while the White Plymouth Rock was used in the development of other broiler breeds making them the mother/sister bird for the Cornish cross breed, an excellent meat bird. The popularity fell to a domestic fowl and are now listed as "recovering." The Barred variety is also known to be praised in shows for their exaggerated and unique soft feathers. 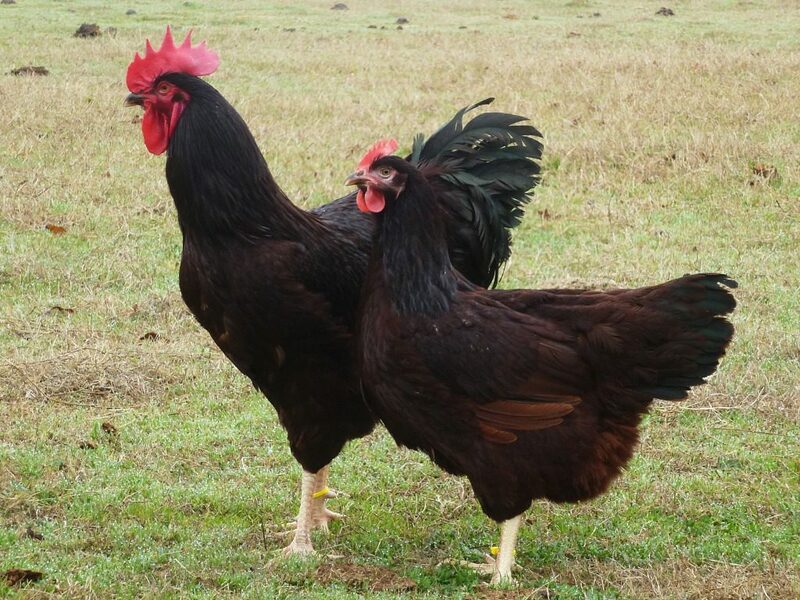 These are large fowls with females 6.5 pounds and males at 7.4 pounds. They are dual purpose and hardy (resistant to cold) birds. They have a high production rate of large, light brown/cream eggs. They are prone to frostbite do to their long crowns. 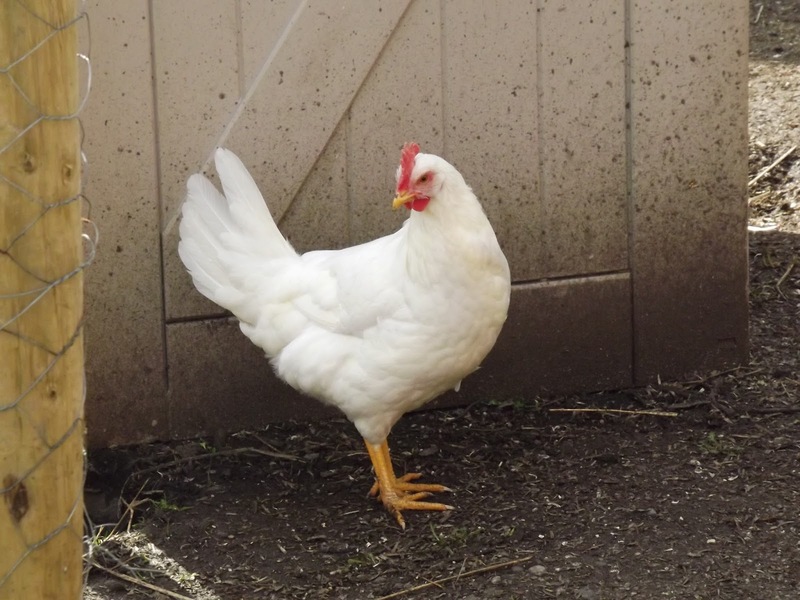 This dual purpose breed was mainly produced for early maturing, fast growing, fast feathering, and producing a good table bird with hens having good egg laying abilities. They only come in the color Red. They are overall a well rounded breed. This breed has to be watched so it isn't overly bossy to more gentle breeds. They make good free ranging birds. This breed goes broody frequently making good mothers, while still being friendly and noisy. They lay large, brown eggs with some strains of the breed laying dark brown. These are large fowl birds with the males being 8.5 pounds and females being 6.5 pounds. These birds only come in one color Red... hence the name. These birds are popular throughout the world, being one of the most easily recognizable breed. 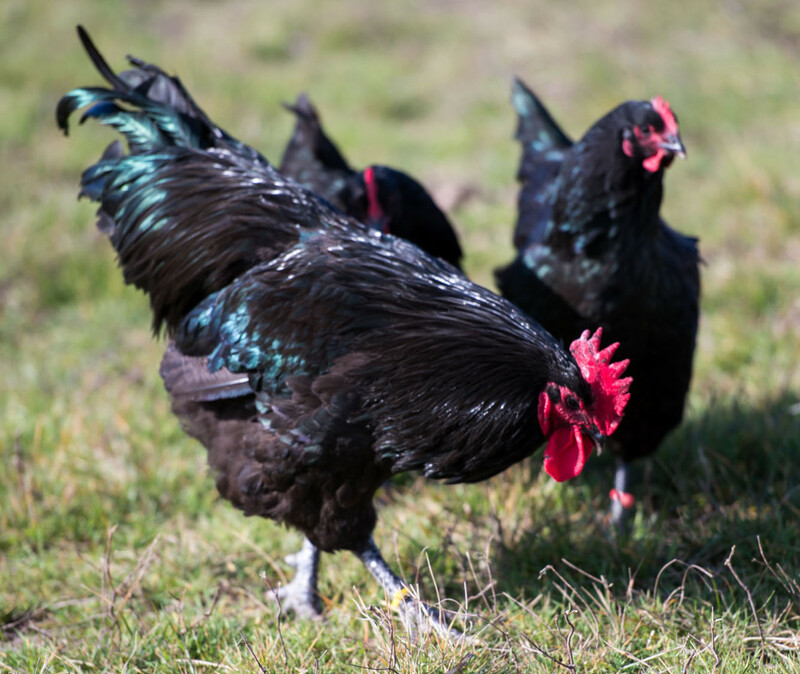 The tradition "old type" hen is a dual purpose layer bird but some of the hens have been predominantly breed for better egg quality as they have been used to breed many high production rate hybrids. These birds have a high production rate of large, brown eggs. It is another large breed with the females at 6.5 pounds and the males at 8.7 pounds. They are cold tolerant and can be easily handled as these birds don't stress as easy making them ideal free range birds but less likely to get away from predators because of this. 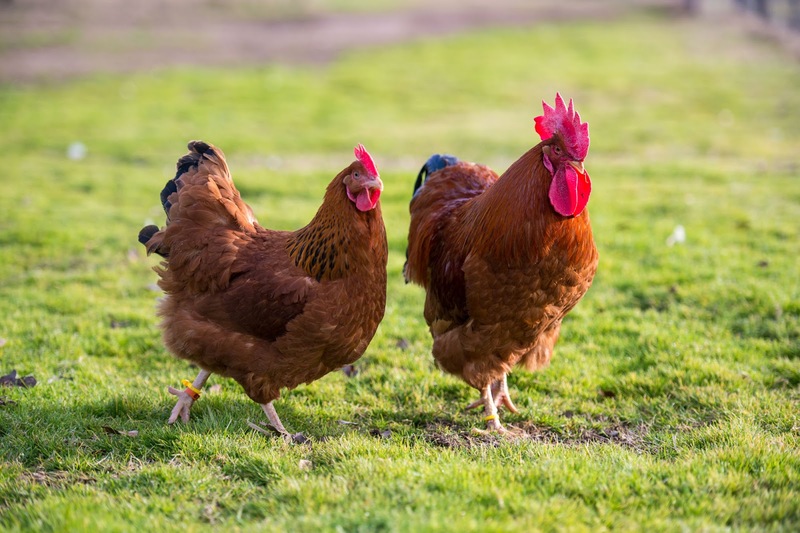 This dual purpose breed is praised by many as they did set a world record when a well breed hen laid 364 eggs in 365 days (one year). The most popular color and the only color recognized by the United States of America is black, but they can come in Blue, White, Buff, Splash, Wheaten Laced, and Golden. These docile birds are quite big at 7-9 pounds for the males and 4.9-6.8 pounds for the females. They have a high production rate of large, brown eggs. They are tolerate to most climates as they are a hardy breed with soft feathers. This is another dual purpose breed. This breed is mostly popular for their uniquely colored eggs. These bird are often refereed to as "Easter eggers." While Ameraucanas produce blue eggs. 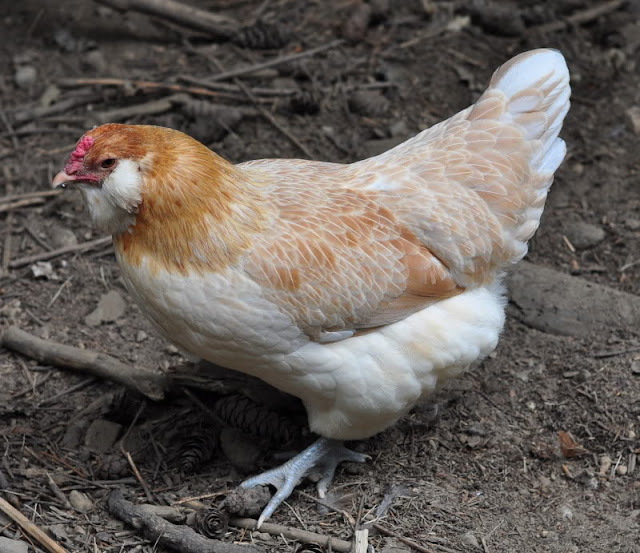 An Olive Egger, a chicken that lays olive green eggs, is the product of a cross between a hen and rooster that are from a brown egg and a blue egg (Ameraucana) laying breed. Other strains of this breed can also be found in Black, Blue, Blue Wheaten, Brown, Red, Buff, Silver, Wheaten coat colors. This is a very distinctive breed with a pea comb and a beard. These friendly, flighty birds lay medium, blue eggs. Great if you want to add a bit of surprise and color in your eggs basket. 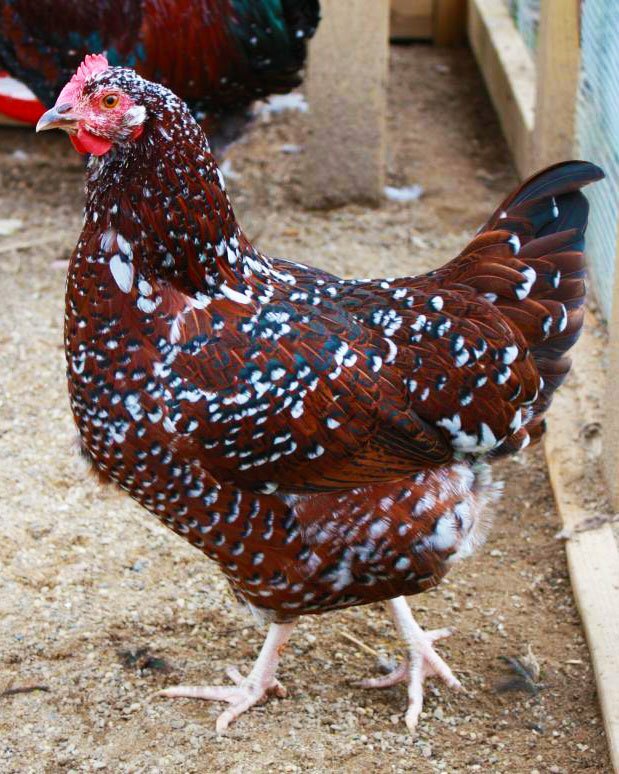 These large fowls are 5.5-6.5 pounds for males and 4.5-5.5 pounds for females. 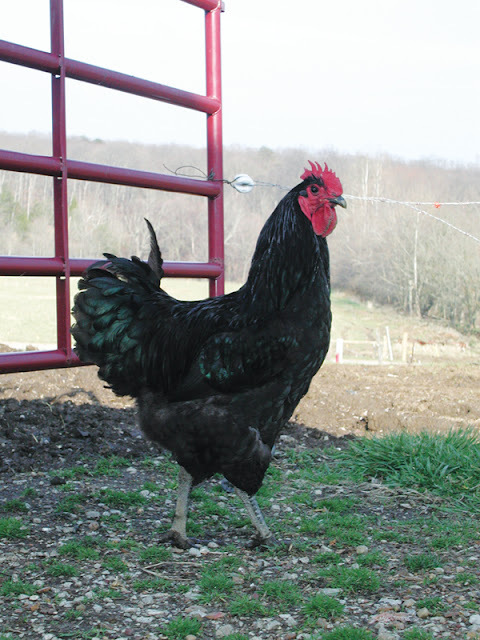 The Wyandotte is a dual purpose breed and a popular show bird in Germany. These gorgeous birds come in Black, Blue, Buff, Columbian, Golden Laced, Partridge, Silver Laced and Silver Pencilled for the American Poultry Association and Barred, Black, Blue, Blue-Laced, Blue Partridge, Buff, Buff-Laced, Columbian, Gold-Laced, Partridge, Red, Silver-Laced, Silver-Pencilled and White for the Poultry Club of Great Britain. These striking birds are large fowls while the females weigh 6-7 pounds and the males 8-9 pounds. They lay large, brown eggs. With an easy, calm, quiet attitude you really can't go wrong with this breed. This dual purpose bird is one of the oldest chicken breeds, as you can tell this is a good breed. They come in colors of Red, Buff Columbian, Brown, Coronation, Buff, Speckled, Silver, Light, and White. The Sussex chicken is an alert docile breed that can lay brown, cream, or tan eggs. They have a high productivity of large eggs. The males are large at 9 pounds and the females at 7 pounds. They were first a table bird (meat bird) but turned into a more egg productive bird while still caring delicious meat. 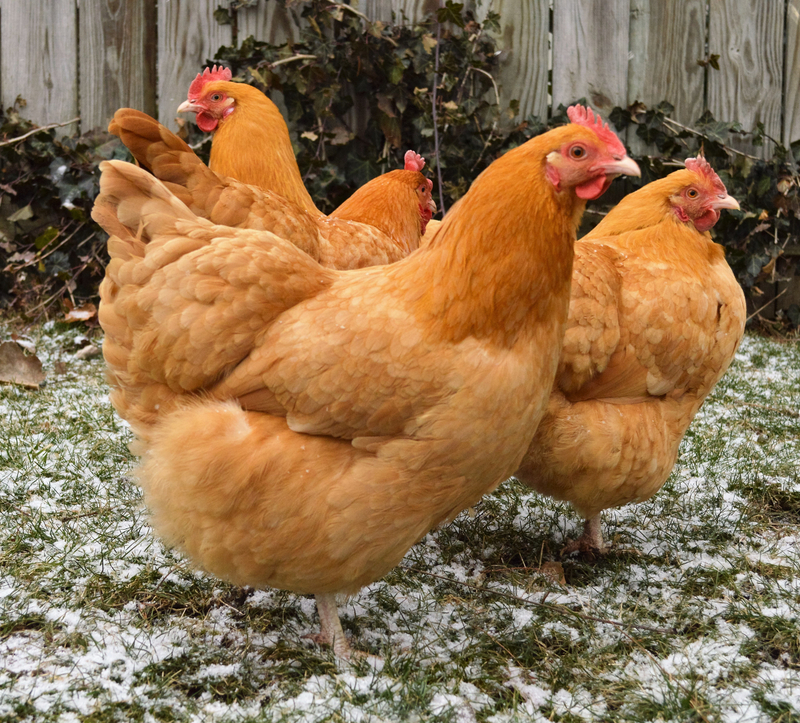 Hens will produce 180-200 eggs while some strains of the bird will lay 250. They go broody frequently. 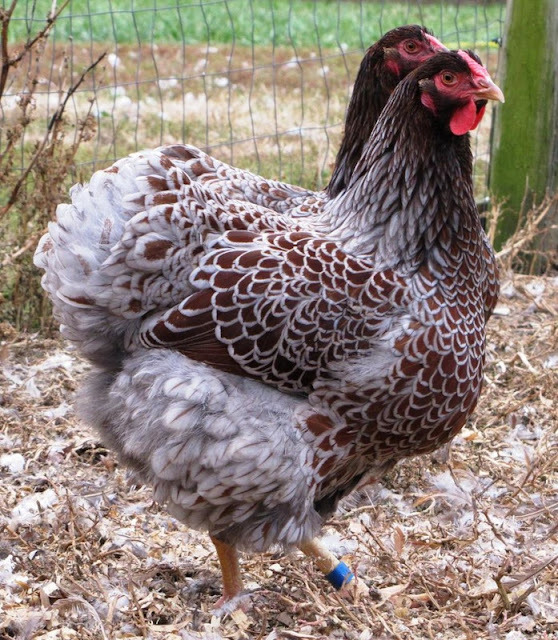 Like all breeds of chickens Orpingtons come in many colors. The most popular Orpington is the Buff Orpington but they can come in Blue, Buff, Black, and White. Overall, these birds are dual purpose making them a good egg layer while still retaining great meat quality. They have a tendency to become overweight causing soft shelled eggs. They are large fowls with the males being 7.9-10 pounds and the females being 5.9-7.9 pounds. They lay large to medium, light brown eggs. They have a calm temperament and go broody frequently but are good mothers. They are mostly used as show birds because their quality and due to their soft fathers, this makes them hardy and good for backyard flocks. They are prone to frostbite. These pretty birds are exactly what their name implies... GIANTS. They have a high production rate considering their stature. These birds are also dual purpose and definitely aren't lacking on the meat. They come in Blue, Black, White, and Splash. A large amount of food and time is required for the breed to achieve its full size. The hens will lay very large, light brown to brown eggs and can go broody. The males are 10 pounds while the females are 9 pounds. Still a very large hen. Though they were produced as a meat bird, they have been tossed aside for more faster growing chicken breeds (such as the Cornish cross). These birds are popular only for their eggs as they are not dual purpose. They come in colors White, Light Brown, Dark Brown, Black, Blue, Buff, Columbian, Buff Columbian, Barred, Exchequer and Silver. This recovering breed can even reach up to 300-320 eggs annually. This is a friendly, flighty, noisy breed. Not best for a backyard in close proximity to your neighbors. This doesn't stop people from adding them into their flocks. They have a high production rate of large, white eggs. The males can weigh up to 5.3- 5.9 pounds and the females 4.4-5 pounds, making them a rather small breed compared to our other breeds on this list. THE JOY OF A PULLET'S FIRST EGG?